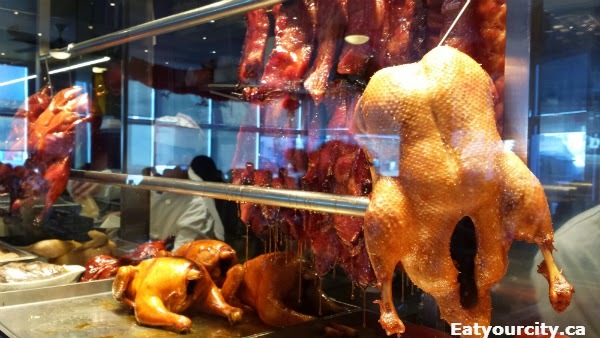 Eat Your City: Sun Chiu Kee BBQ Restaurant 新釗記 Calgary, AB - great lunch menu and BBQ pork! Sun Chiu Kee BBQ Restaurant 新釗記 Calgary, AB - great lunch menu and BBQ pork! 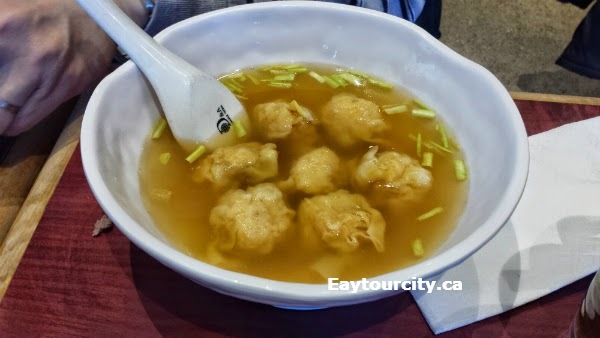 Posted by On a sunny Sunday morning, we waded into the crowds at Sun Chiu Kee BBQ Restaurant. Its just located inside a grocery store and it was packed even early in the morning as patrons lined up to order BBQ items to take home and what looked like a choreographed chaos inside the bistro/cafe sitting area where it was a frenzy of noise, food and busy efficient waitstaff running around. After a short wait, its onto the food! 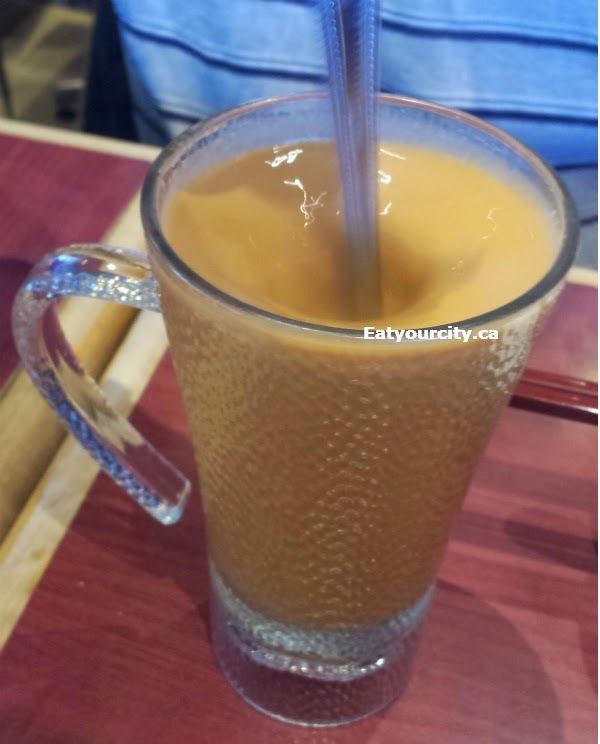 Along with the regular wealth of traditional Chinese teas you can order, they have Hong Kong Style milk tea as well, which fiancé's parents promptly ordered. Its brewed strong and on the barely sweet side so they added some sugar to help tame the strongly flavored tea. We started with the panfried rice noodles with peanut and sweet sauce. 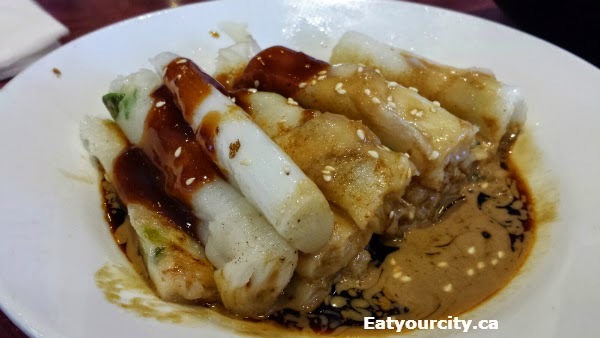 The rolled noodles had a nice crispy exterior, soft interior and were gobbled up quick with the accompanying rich peanut and sweet sauce. The blood pudding congee had some generous cubes of blood pudding in it. Blood pudding is considered a delicacy to some (its an acquired taste - I acquired it years ago when my Vietnamese girlfriend made me a traditional bowl of bun bo hue - spicy seafood noodle soup). In plain English, its made with fresh pork blood, coagulated with a bit of salt. 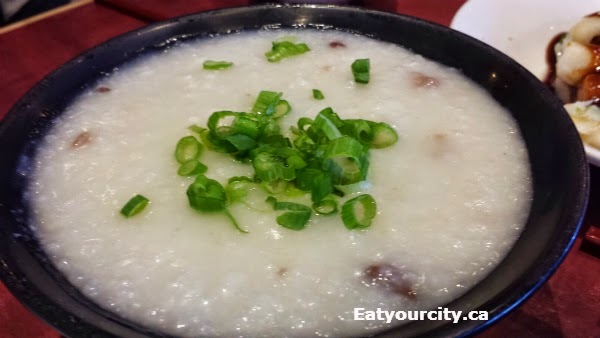 Its gently cooked in soups, incorporated into sausage (like black sausage), or in this case, into congee, where its a silky smooth jello-like cube that tastes faintly like liver. Yum! The next dish was a pork and vegetables chow mein. 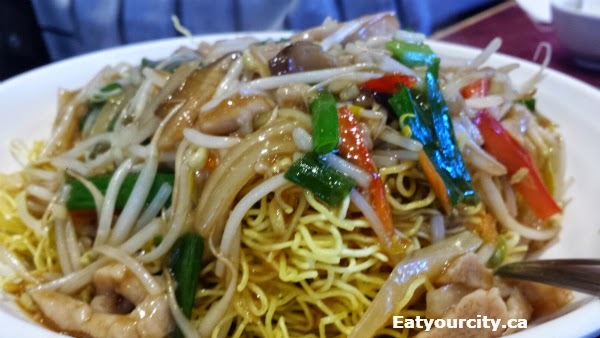 There was a generous helping of sauteed pork strips and julienned vegetables in a tasty savory sauce crowing a large platter of crispy chow mein. We had to ned up packing some of this home as it was a really big portion! 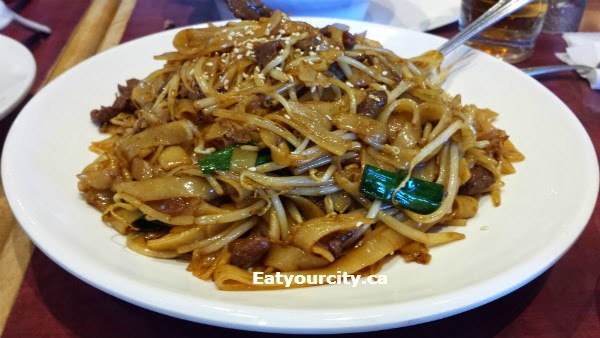 The Beef fried Ho fan with bean sprouts or sauteed beef with rice noodles and beat sprouts was nicely executed with tender pieces of beef and aromatic salty savory noodles. Nom! The Shrimp wonton soup had lots of ping pong sized shrimp wontons. Each wonton was filled with lots of whole sweet crisp shrimp. We didn't have room to eat the BBQ items, so fiancé's mom picked up a bunch to go (no pics sorry!). The char-siu (maltose glazed BBQ pork loin) was tasty, as was the whole BBQ duck. 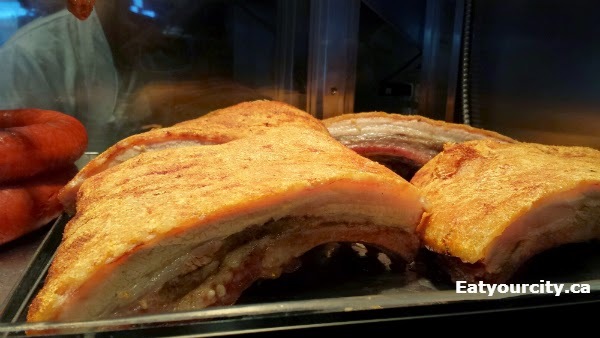 But we'll definetely be back for the amazing BBQ pork - super crispy skin, not too fatty, ultra moist flavorful pork belly. So good! Probably the best BQ pork I've had in Calgary.